The expo is held in the Grande Ballroom at the Hilton San Diego/Del Mar. Located just steps from the half marathon start line, this is the perfect venue for our large expo. Remember, this shopping experience is FREE and open to all, so bring your family and friends. Complimentary bus service will transport runners from the finish area (La Jolla Cove) to the Half Marathon Start (Del Mar) before the race. YOU MUST BE IN LINE BY 5 AM to board the last bus. 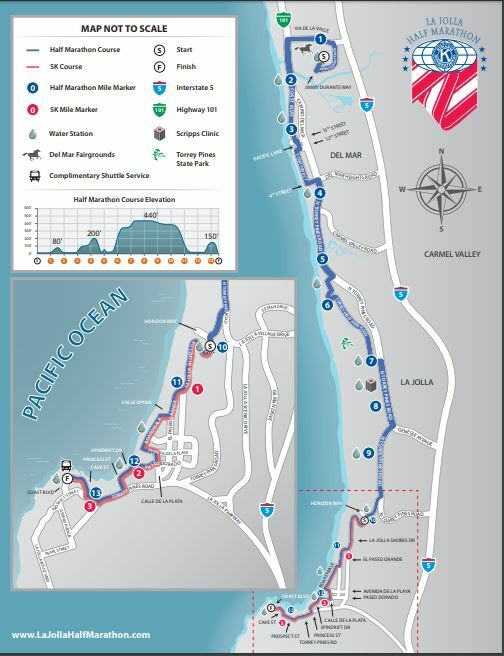 Complimentary bus service will transport 5K runners from the finish area (La Jolla Cove) to the La Jolla Shores 5K Start (above La Jolla Shores Drive at Horizon Way) before the race. Starting at 8 AM, complimentary buses will transport runners from the finish area (La Jolla Cove) to the Half Marathon Start parking lot. The Last Post-Race Bus will depart the Cove at 11:30 a.m. The finish line for both events will be at the La Jolla Cove (Scripps) Park located in the 1100 block of Coast Boulevard. Take I-5 South to La Jolla Village Drive. Proceed West approximately 0.7 mile to Torrey Pines Road (stoplight) and turn left (South). Drive about 2.7 miles to Prospect Place (stoplight) and turn right (West). Proceed down Prospect, park in La Jolla and walk down to the Cove (Scripps) Park. Take I-5 North to La Jolla Parkway and proceed West approximately 2.5 miles to Prospect Place (stoplight) and turn right (West). Proceed down Prospect, park in La Jolla and walk down to the Cove. Park only in marked spaces and avoid areas which may cause a safety hazard or block driveways. Watch for NO PARKING signs, as several streets will be closed for this event. Vehicles blocking emergency access, double parked or parked in no parking areas will be towed. Avoid Coast Boulevard adjacent to the finish line. Adequate street and public parking is available in downtown La Jolla. The La Jolla Half Marathon will start promptly at 6:30 AM. in the main parking lot of the Del Mar Racetrack. All runners should be in the start area no later than 6:15 AM. Anticipate traffic delays if you’re dropping off runners or parking. If you park at the start and need a ride back to your car after the race, complimentary bus service will be provided, see the Bus Shuttle section above for details. NOTE: While there is plenty of free parking at the Del Mar Fairground, it will be VERY BUSY with considerable traffic delays before the race. We strongly recommend parking in downtown La Jolla and taking the event shuttles to avoid missing the race start. Take I-5 South to Via de la Valle. Proceed West approximately 0.1 mile to Jimmy Durante Boulevard (stoplight) and turn left (South). Follow the signs and Traffic Controllers to parking and runner drop off areas. Parking lot ingress and egress may be restricted or closed prior to the race start. JIMMY DURANTE BOULEVARD WILL BE CLOSED FROM 6:15 to 7 AM. Take I-5 North to Via de la Valle. Proceed West approximately 0.1 mile to Jimmy Durante Boulevard (stoplight) and turn left (South). Follow the signs and Traffic Controllers to parking and runner drop off areas. Parking lot ingress and egress may be restricted or closed prior to the race start. JIMMY DURANTE BOULEVARD WILL BE CLOSED FROM 6:15 to 7 AM. Plenty of free parking is available for runners adjacent to the start area at the Del Mar Racetrack but it will be VERY BUSY. Anticipate traffic delays and follow the signs and traffic controllers on Jimmy Durante Boulevard to the parking areas. Parking lot ingress and egress may be restricted or closed prior to the race. If you need a ride back to your car after the race, see the Bus Shuttle section above. The 5K starts promptly at 6:30 AM. Runners should plan to be at the race start near the corner of La Jolla Shores Drive and Horizon Way, no later than 6:10 AM. Take I-5 South to La Jolla Village Drive. Proceed West approximately 2.1 miles (La Jolla Village Drive becomes North Torrey Pines Road at intersection) to La Jolla Shores Drive (stoplight) and turn left (South). Travel approximately 0.2 mile to Horizon Way. Parking is very limited in the residential area adjacent to the 5K Start. If you don’t take the bus, allow time for a half-mile walk to the start. Take I-5 North to La Jolla Village Drive. Proceed West approximately 2.2 miles (La Jolla Village Drive becomes North Torrey Pines Road at intersection) to La Jolla Shores Drive (stoplight) and turn left (South). Travel approximately 0.2 mile to Horizon Way. Parking is very limited in the residential area adjacent to the 5K Start. If you don’t take the bus, allow time for a half-mile walk to the start. Parking is very limited in the residential area adjacent to the 5K Start near the corner of La Jolla Shores Drive and Horizon Way. If you don’t take the bus, allow time for a half mile walk to the start. Due to steep downhills on both the half marathon and 5K courses, strollers are not allowed in either event. There is no official minimum age requirement for the half marathon, we recommend all half marathon participants be at least 12 years old on race day. All participants under 18 must have their event waiver signed by their parent or legal guardian. In addition, we recommend everyone under 16 years of age on race day be accompanied by their parent or legal guardian (who is also registered for the event) during his/her participation. Due to steep downhills on both the half marathon and 5K courses, racing chairs or handcycles are not allowed for safety reasons. How was La Jolla Half Marathon & Shores 5K?